If you are a regular follower of this blog you will know that decision modeling is an important technique for improving the effectiveness, consistency and agility of your organization’s operational decisions and a vital adjunct to the continuous improvement of your business processes. —David Herring, Manager of BPM & ODM Delivery at Kaiser Permanente. —Alan Fish, Principal Consultant, Decision Solutions, FICO and author of “Knowledge Automation: How to Implement Decision Management in Business Processes”. —Jim Sinur, Vice President and Research Fellow, Aragon Research. —Denis Gagne, Chair of BPMN MIWG, CEO & CTO at Trisotech. 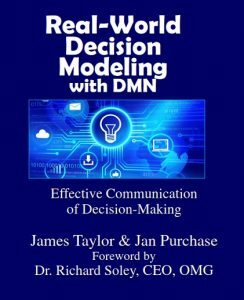 I very much hope you will buy and enjoy Real-World Decision Modeling with DMN. I’d love to hear what you think of it and stories about how it helped you on projects so please drop me a line. What are you waiting for? Go buy it – Meghan Kiffer, Amazon, Barnes and Noble.